To commemorate forty years of publication, the world’s #1 drum magazine offers a limited run of handmade snare drums. 2016 marks the fortieth year of publication for M​odern Drummer​. To celebrate four decades as the world’s most widely read magazine exclusively for drummers, the company enlisted the help of master craftsman Bruce Hagwood of RBH Drums to build a very limited run of unique, handmade solid-shell and 3-ply snares. For all-purpose applications requiring a super-sensitive, warm, and powerful tone, there’s a 5.5x14 single-ply maple drum with slightly rounded 45-degree bearing edges. 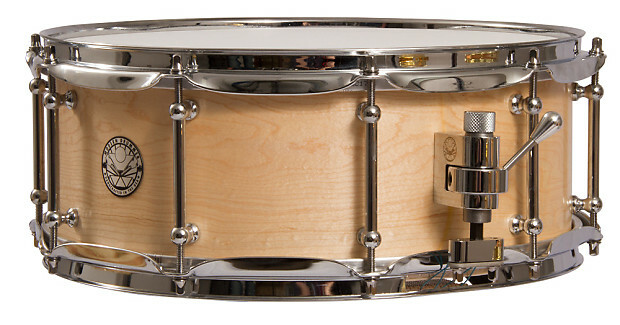 For a darker and more vintage timbre, there’s a 6.5x14 3-ply mahogany/poplar/walnut with fully rounded bearing edges. And for a more focused, contemporary “pop,” there’s a 6x13 single-ply cherry adorned with a gorgeous curly maple inlay. All of the timber for the shells is hand-selected, molded, cut, and finished by Hagwood at his custom shop in Virginia Beach, Virginia. All three models of M​odern Drummer​’s 40th Anniversary snare drums feature 2.3mm triple-flange steel hoops, custom-made chrome-over-brass tube lugs, Puresound 16-strand wires, Evans G1 Coated batter heads and 300 Clear bottoms, laser-etched chrome Trick G007 three-point throw-offs, and a special-edition M​odern Drummer​ logo round badge. Modern Drummer​’s 40th Anniversary snare drums are being sold for a limited time via online marketplace Reverb.com for $999 each. Modern Drummer​ is a monthly publication targeting the interests of​ drummers and percussionists. The magazine features interviews, equipment reviews, and columns offering advice on technique, as well as information for the general public. First published in 1977, today the print version of M​odern Drummer​is available in 67 countries. The monthly digital edition, enhanced with music and videos corresponding to the current issue’s contents, is available online.